What is small plot research? At the University of Illinois Research Centers we do small-plot research. This isn't research that takes place in the highly controlled environment of a laboratory or a test tube, but outdoors. A farm field is a diverse environment, with many abiotic factors (rocks and other inorganic soil components, soil nutrients, residual pesticides, temperature, humidity, wind, precipitation, etc.) and biotic factors (biological soil components, bacteria, fungi, nematodes, insects, worms, small animals, etc.) scattered unevenly throughout the environment. These many factors interact to create a very complex system. 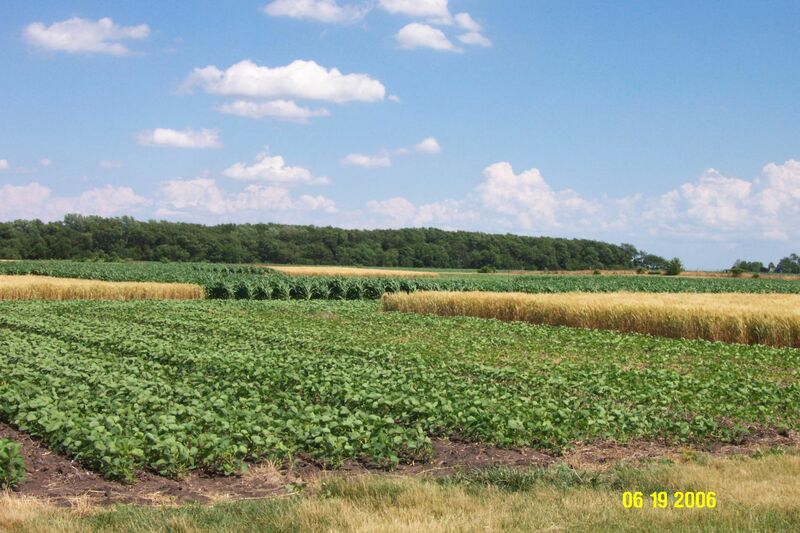 There is a lot of variability within a 40 or 160 acre farm field. How then, with all of these factors being present in different quantities throughout the environment, do we investigate the effect of a particular soil amendment, for example, on corn yield? We use small-plots to control as many sources of variability that we can so that if the soil amendment causes an effect on yield, we can detect it. Let's talk about this example in detail. To test the effect of the soil amendment on corn yield, we randomly apply each treatment (soil amendment, no soil amendment) to adjacent plots that are as alike as possible except for the treatment. 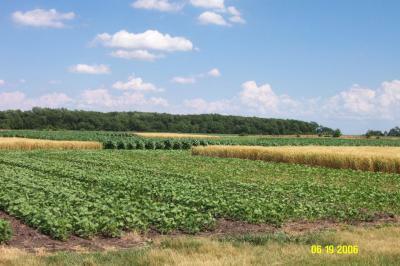 For example, on the land that will house the experiment, the previous crop was corn, all of the soil had the same nutrients applied in the previous and current growing year, tillage methods are the same, the hybrid, plant population, row spacing, seeding depth, and planting method are the same, any pesticides are the same (herbicides, fungicides, insecticides, etc.) and the plot dimensions are the same. We also need to minimize variability in the way that we collect data. In this example, we would need to collect all of the yield, test weight and moisture data on the same day using a carefully calibrated plot combine. We can make a conclusion about the effect of the soil amendment on yield by comparing the corn yield of the plot that had the soil amendment to that of the plot without the soil amendment, right? Wrong. What if there was some unknown, underlying factor that made it so that one plot out-yielded the other (example: a large rock)? Experiments have replications (each treatment randomly is assigned to multiple plots), so that we can minimize the chance that the yield differences that we are seeing aren't just due to some unknown factor, like a rock or random chance. We can compare the 2012 corn yields in this experiment and make a recommendation about whether or not the soil amendment increases corn yields, correct? Nope. Just like replicating the treatments within the experiment, we need to collect data from multiple years to be able to confidently (and responsibly) make recommendations about this particular soil amendment. We can look back to the 2012 growing season to see why multiple years of data are required. Nothing was 'typical' about the 2012 growing season; at the NWIARDC temperatures were above normal between January and August and below normal precipitation led to extreme drought conditions. I can't tell you how many times I have heard a variation of the following statement: "A farmer was treating his field with x chemical and ran out. You wouldn't believe the difference in the health of the plants between the treated and untreated sections of the field." This observation is what we call 'anecdotal evidence'. Anecdotal evidence is a non-scientific observation that doesn't provide proof, but can assist researchers in identifying topics to research further. This anecdotal evidence is important, but it is not wise to make management decisions based on these observations alone. Why? In the example where a farmer ran out of chemical x, there may be many other reasons for the visible differences in plant health other than the chemical. A couple of possibilities: 1) the farmer may have applied the chemical to the portion of the field with historically better soils and therefore better plant health; 2) If the farmer underestimated the amount of the chemical need to spray his field, perhaps he underestimated the amount of other chemicals to purchase as well. Perhaps the end of the field that didn't get the chemical may also have gotten less or none of other chemicals as well; 3) Maybe the end of the field that didn't get the chemical was on a hill and didn't have as much soil moisture retention as the treated section of the field in a drought year; 4) Perhaps the end of the field that didn't get the treatment is at the bottom of a slope where soil-borne plant pathogens tend to settle. Most corn and soybean producers collect anecdotal evidence on their own farms by changing one or more practices within a growing season to try and improve yields and their bottom line. This is great and experimentation is what has brought us cultivated varieties from wild plant relatives and many other important innovations. A couple of suggestions: 1) leave controls, or sections of the field that have not been treated/changed, for comparison; 2) don't change more than one thing at a time, or you will have a hard time distinguishing what may be causing the effect; 3) have the control and the change in the same field; 4) try to have replications if possible; 5) Lastly, contact your local Illinois Research and Demonstration Center or extension office to see whether there is experimental evidence to supplement your observational or anecdotal evidence. As a non-farmer, I had no idea this experimentation was so complicated, or interesting. I would guess that the U of I Extension Service, having no ulterior motive (ie: profit making on sales of fertilizers, pesticides, and other soil amendments, etc.) are the people to listen to. Thanks for all the good work you do.